New TV Show ‘Living Biblically’ Should Be Called ‘Mocking Blasphemously’! The new CBS show, Living Biblically, is a TV adaptation based on A. J. Jacobs’s The Year of Living Biblically, where the author (a confessed agnostic), chronicles his “stunt” in trying to live by the Bible. If CBS were honest, the series would more accurately be titled Living Blasphemously, as it is simply more Hollywood mockery of Christians, God’s Word, and the Lord Jesus Christ. The series, which is filled with cheap laugh tracks, is based more upon a running bar joke expressed in the pilot: “A priest, a rabbi, a lapsed Catholic, and a nonbeliever walk into a bar…” than it is Jacob’s slightly more serious book. The main character, Chip Curry (Jay R. Ferguson), who allegedly aspires to live by the Book, and a Rabbi named Gil (David Krumholtz), and a priest named Gene, go into a bar, literally…over and over again, never appearing to cease from drinking or serving up plenty of blasphemy. The Rabbi and the Catholic priest serve as Chip’s “God squad,” allegedly advising him on how to apply God’s Word to his everyday life. The show’s premise could not be more antithetical to the heart of the biblical message of salvation by grace through faith in Christ. Chip’s conversion is not based on a confession before God that he is a sinner and embracing Jesus as Lord and Savior, but rather on a vain confession before the catholic priest that he is actually “a good man” and wants to live by the bible. After Chip shares with the priest that he wants to live his life according to God’s Word, the priest lets out a huge guffaw, as though the whole concept of following the Lord’s Word is a joke. From this point onward, Chip’s life becomes one big joke. 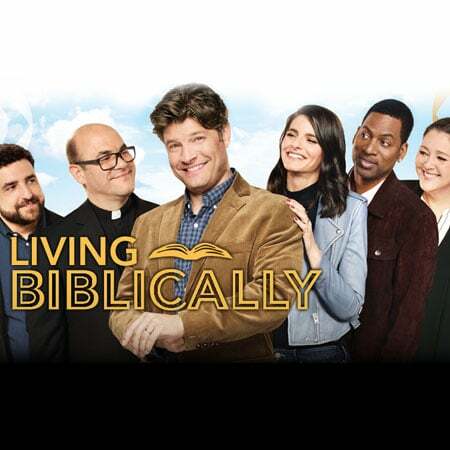 The script for Living Biblically reads like it has been written by your typical, cynical, atheistic, internet trolls; as the story lines feed into almost every stereotypical caricature of Christianity that we find on the World Wide Web. In one episode, after consulting his priest about a friend who is committing adultery, the priest tells him, “The bible says you are suppose to stone adulterers.” The priest then proceeds to warn Chip that the only thing that prohibits him from carrying out God’s command is that he will be “arrested” if he obeys God’s Word. Of course, the show’s writers fail to inform their audience that this command was never given to Christians, and that Christians are not under the Old Covenant Law. Nor are they informed that Christians are not to stone anyone for anything. Nor do they share the fact that after certain Jews brought a woman to Jesus, claiming she was caught in adultery, Jesus warned them, “let the one who has never sinned throw the first stone at her” (John 8:7). Nor do we hear of Jesus’ death for the adulteress woman’s sins, or of Jesus’ warning to her “go and sin no more” (John 8:7). After the Catholic priest wrests God’s Word from its biblical context, and wrongly advises Chip, “The bible says you are suppose to stone adulterers,” Chip confronts his adulterer friend while he is sitting with a woman at a restaurant. Chip proceeds to throw a huge rock into his friend’s head, and then promptly flees to avoid being arrested. Of course, the cheap laugh tracks erupt and Christians are made to look like idiots, as potentially millions in the TV audience are unaware of what the Scriptures actually teach. Tragically, many professing Christians have claimed that they love the show, and seem unaware of the reality that Satan is the “prince and the power of the air” who “works through the children of disobedience” (Ephesians 2:1-3); and that he is actively blinding the lost to the truth of the gospel through hit pieces like Living Biblically. (cf. 2 Corinthians 4:3-4). They seem unaware of the fact that Hollywood is run by those who have long jettisoned any semblance of a moral compass, or that to be “successful” in Hollywood you typically have to sell your soul to the devil or your body on a casting couch. One of the evidences of the reality that Jesus is Lord is that despite his glorious teaching, compassionate miracles, and sacrificial death for the sins of the world, He is the singular focus of ridicule by the powers of darkness. This fact is manifested daily through popular music and the entertainment industry in general. While it is common to mock Christ and Christianity and use His name in vain, when is the last time you saw Buddhism or Islam mocked by the mainstream media? I don’t expect to see CBS or any of the other major networks introducing a new TV show called “Living Quranically,” that mocks Islam or the prophet Muhammad anytime soon! We need to pray for the salvation of the lost and those who are leading them astray. For God will not be mocked, “Do not be deceived, God is not mocked; for whatever a man sows, this he will also reap” (Galatians 6:7). “So we have the prophetic word made more sure, to which you do well to pay attention as to a lamp shining in a dark place, until the day dawns and the morning star arises in your hearts … Know this first of all, that in the last days mockers will come with their mocking, following after their own lusts” (2 Peter 3:3). “For whom blackest darkness has been reserved forever … See, the Lord is coming with thousands upon thousands of his holy ones to judge everyone, and to convict all of them of all the ungodly acts they have committed in their ungodliness, and of all the defiant words ungodly sinners have spoken against him” (Jude 1:13, 15). “At one time we too were foolish, disobedient, deceived and enslaved by all kinds of passions and pleasures. We lived in malice and envy, being hated and hating one another. But when the kindness and love of God our Savior appeared, he saved us, not because of righteous things we had done, but because of his mercy. He saved us through the washing of rebirth and renewal by the Holy Spirit” (Titus 3:3-5). Sadly, the wicked spend an awful lot of time undermining the gospel, perverting His Word, and blaspheming His Holy Name! May the Lord Jesus give us grace to spend even more time sharing His great love and glorious gospel with a lost and dying world.